2 Is Political Correctness “out of school”? 4 Easter gathering–Good Friday April 3rd–Monday 6th. 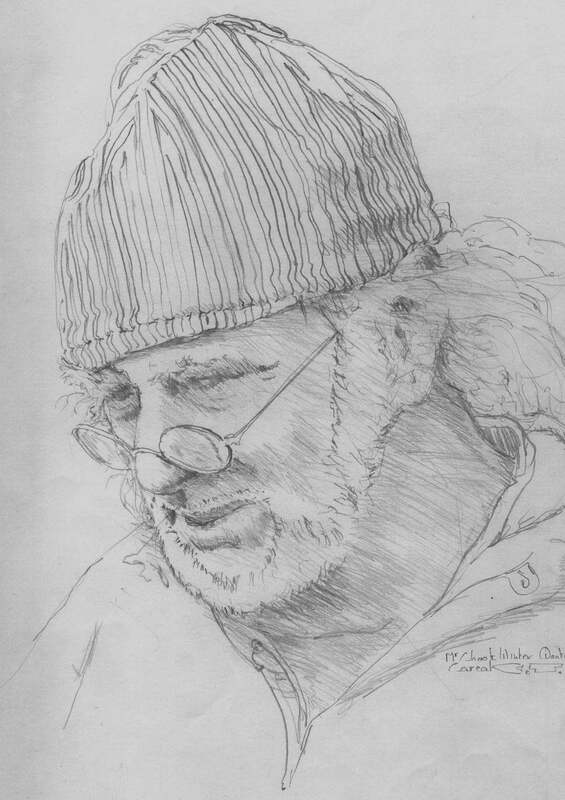 “Mr Chook” – the final work in our series of pencil drawings by Charlie Timma. Welcome to another waffle on club doings. Your editor received a much appreciated Email just recently. From Bruce D it simply stated “Awesome Newsletter”. That’s the nicest bit of feedback for many a month. And it serves to remind me to once again request member input to maintain the standard of our/your newsletter. Contributions of handy hints, camping or shooting tips, hunting stories, accompanying photos, you know the stuff! Keep ‘em coming! Meanwhile, enjoy this latest edition of The Traps. 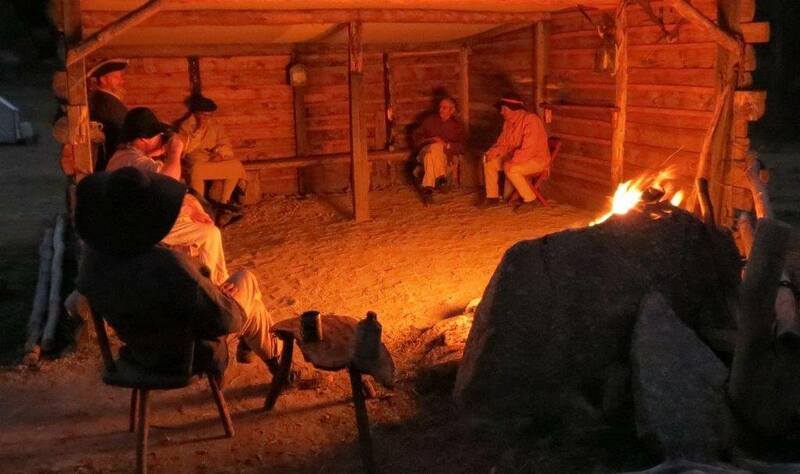 June 6th, 7th & 8th Queen’s Birthday holiday weekend – mark your calendars now for our Winter Quarters camp – for serious Hivernants, Greenhorns and Flat-Landers too! Flintlocks, Caplocks and Cannons but unfortunately our 3rd Hershel House shoot deferred pending acquisition of a more suitable porch rocking chair and a level porch. Is Political Correctness “out of school”? So, are we students of fur trade history to deny the existence of that class of voyagers known historically (either derogatively or pseudo affectionately) as “pork-eaters” in our re-enactments? Although sanitised in later years by generalisation the term remains a valid historical social descriptive part of the era that we love. Oh, and it has nothing to do with any religion or race. Aussie cricket fans would undoubtedly consider “pork-eater” sledging as quite kosher. Way back in October 2009 Clive and Veronica shared the sentencing by American Judge Roy Bean upon Jose Manuel Miguel Xavier Gonzales with readers, but yours truly never provided Jose’s right of reply. Just to reset the scene I’ve reprinted the legendary Judge Roy’s sentence (from Vol 20) followed here now by Jose’s reply. “Jose Manuel Miguel Xavier Gonzales, in a few short weeks it will be spring. The snows of winter will flee away, the ice will vanish and the air will become soft and balmy. In short, the annual miracle of the years will awaken and come to pass, but you won’t be there. The rivulet will run its soaring course to the sea, the timid desert flowers will put forth their tender shoots, and the glorious valley of this imperial domain will blossom as the rose. Still, you won’t be there to see. From every treetop some wildwoods songster will carol his mating song, butterflies will sport in the sunshine, the busy bee will hum happily as it pursues its accustomed vocation; the gentle breeze will tease the tassels of the wild grasses and all nature, Jose Manuel Miguel Xavier Gonzales, will be glad but you. You won’t be here to enjoy it because I command the Sheriff, or some officers of the country, to lead you to some remote spot, swing you by the neck from a knotting bough of some sturdy oak and let you hang until you are dead. Seemingly unperturbed by the severity of the brutal sentence, neither flabbergasted by the descriptive prose, it turns out Jose Gonzales, a poor sheep-herder, was also capable of a little articulacy, in a fashion, and totally unafraid to match dialogue with the judiciary, whilst coming clean with an ultimate confession. “I admit I’m a thief, but so eager was this court to add another to its already long list of slaughtered victims that you remind me more of buzzards hovering over a carcass than men supposed to dispense justice. You half-starved hyena, you’ve sat through this trial with devilish glee written all over your hellish face. You talk about spring with its sweet-smelling blossoms and fall with its yellow moon; you damned offspring of a diseased whore. You say that I am to be hanged and, as I gaze into your bloated whiskey-soaked face, I’m not surprised at the pretended gravity and the evil sarcasm with which you send me to my death. Easter gathering–Good Friday April 3rd–Monday 6th. We had fabulous weather, warm sunny days, clear moonlit nights including a brief but beautiful eclipse of the moon highlighting millions of stars, the Milky Way and the Southern Cross all brighter than ever. Simply splendid and most salubrious! Well there were plenty of liquid refreshments plus some cheap whiskey consumed as we waited on the moon to do its stuff. Here’s health to all pilgrims! It all started two weeks earlier when a small working bee was organised by your committee. Bob Ellis was appointed supervisor with Tom, Jim and Chook all hands on. Then with help from Bernard and his tractor, three post holes were dug and prepared termite proofed posts inserted and set in concrete to mark the extension of the rear wall of our Open-Faced Shelter. Next job was to remove all pine logs from the old back wall to the new, and to cut additional planks to extend the side walls. The roof was then extended, still with canvas ceiling for that authentic look, and the rest would have to wait until willing workers returned at Easter. We had in fact actually achieved much more of the preliminary work than anticipated. This gave us a real chance to have the extension completed in time for Easter Saturday revelling. Peter, Noah, Matt and Murray got off to an early start at Easter with some stone foundation form work, then chinking the pine boards against the cold breezes. The next major task was floor levelling with several trailer loads of loose fill dirt required (thanks Bernard) and a topping of road grit. Again Bob was the architect of the work, but it was marvellous to see everyone present getting stuck into the shovel work. Particular thanks to Matt McMurrich and Charlie Timma. 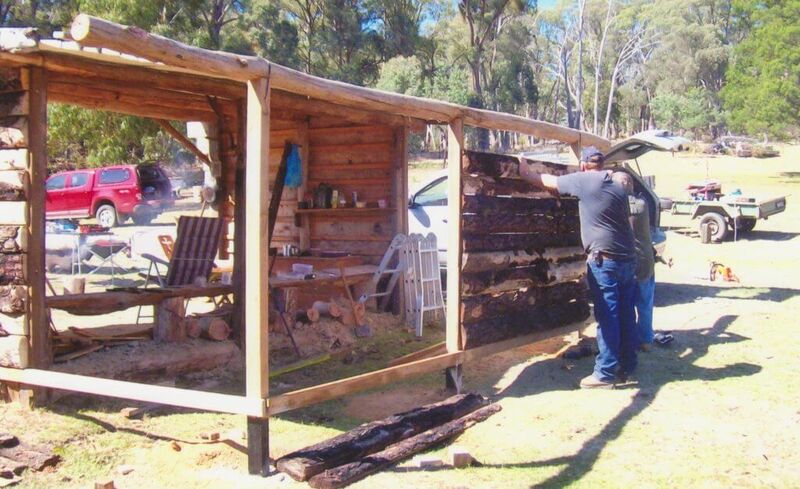 Most of the work was completed when Ian arrived in time to put the finishing touch Facia boards to the shelter. Very timely I thought! Jim led the crew collecting two trailer loads of sticks for cooking fires and always some bigger stuff for the main cabin fire. The urinal shed was cleared and portion utilised for storage and that’s about all the chores done did. Saturday saw plenty of shooting happening although no official competitions were listed. Everyone just did their own practice shooting at plywood rabbits and steel gongs. Peter was using a 50 cal Lancaster; Charlie (a mollydooker) took his time sighting in Filthy Franks right-handed old 45 flinter off the left shoulder; Ian shot his 54 cal Mortimer; Peter shot his 50 cal flinter and Noah just loving a 32cal half-stock caplock. The Bakers were airing out Tippa’s old 32 squirrel gun and the Lindsay’s had another ½ stock caplock. Goes to show ya don’t need prize competitions or silver awards to max out on fun! Tom was rather late arriving on Saturday after completing his work shift. The cooking fire pit that has become known as Tom’s Hole was already a bed of fine coals thanks to Matt. About twenty pilgrims then sat around this fire drinking coffee, watching Tom unload and set up his camp. He didn’t get much help; we all just watched and passed rude or unhelpful advice, ready to give a round hand or some other applause. Warm, cosy and roomy. Photo by Peter. The comforts of the extended Open-faced Shelter were remarked upon by all who gathered for Saturday night festivities. The fire was well stoked and the heat reached well into the larger area. A few drinks were had, in one or two cases a few too many, but hell, it’s Saturday night at Rondyvoo. Ian entertained with guitar and song, Bernard did his usual damper bake, actually it was better than his usual, as it was Judy’s recipe this time. Much later someone reached a mountain high, loudly declaring they had bought a Jeep. They hadn’t! And so merriment and cavorting continued to somewhere around 2am when the ½ price bad whiskey finally ran out. Young Noah received plenty of tuition on the old ways that we used to trap rabbits. Down at the creek he managed to entice a large Prickleback yabby to his bait, eventually snaring it when Charlie fashioned a net for him. Keeping his fingers clear, Noah proudly displayed the yabby to all present, and then gently released it back into the creek to grow even bigger. 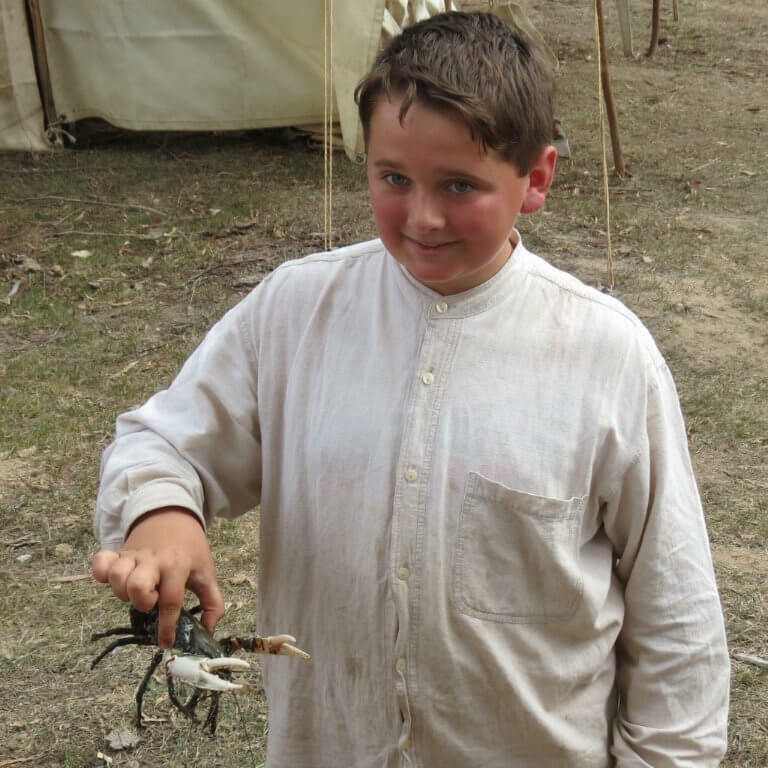 Noah displays his catch – a fine prickleback yabby, released back into the creek after photographs. Sunday morning after leisurely breakfasts (pork sausages, eggs and bacon for Jim and I) some more shootin’ was done. John Morland burned the black with his resurrected Phoenix 45 flinter while Tom was, as usual, making much noise with his 54 full-stock Hawkin. Peter shot his 50 cal flinter and Murray was doing well with his 54 half stock flinter at 93 yards. Others were giving the plywood rabbits another working-over. The afternoon saw the smooth bores brought out. Jim’s Trade Gun, Ian’s 20g Factor’s Trade gun, Tom a Japanese smooth bore flinter to mention a couple. Lots of fun adopting John Morland’s pet loads, consisting of powder charge, a rather close fitting bare ball held down on the powder by only a lubricated felt wad – no card over powder and no patching. This proved quite accurate on gongs at 30 yards on the day! Attendance to the camp numbered eighteen. Special thanks to visiting Frontiers Group members Gary & Jenny Baker, Noel & Sharon Lindsay, Chase & Keith Day and Mark Pountney for joining us, bringing their interpretations, sharing our “Primitive”. Easter 2015 Group line-up outside completed extension of our Open-Faced Shelter. We plan an extra special Spring Rondyvoo with trade blankets, blue beads, mirrors and such, and with a Saturday evening shared feast with festivities emulating the original Beaver Club shebangs. Can you paddle a canoe? Well, it doesn’t matter, there will be tuition available and fortification ! It’s gonna be one heck of a fantastic lark! Oh! Alouette, gentile alouette…. A Newsletter Extra courtesy of Clay Buster and well worthy of your attention. The Nationals Senator for Victoria Bridget McKenzie said today the demonisation of licensed and responsible firearms owners by the Greens must stop, following the tabling of the Senate’s Inquiry into the ability of Australian law enforcement authorities to eliminate gun related violence in Australia. Senator McKenzie said the report, tabled today, found that only four hundredths of one per cent of all registered guns in Australia were stolen and only five per cent of those were used to commit a crime. “Greens Senator Penny Wright has been waging a relentless scare campaign trying to demonise licensed and responsible firearms owners,” Senator McKenzie said. “Many of the claims made by Senator Wright, including her statement that ‘most illegal guns are not trafficked into Australia, but stolen from registered owners’ has not substantiated in the findings of this inquiry. Senator McKenzie said the Firearm Safety and Training Council and NSW Police submitted evidence which showed that illegal importation of firearms was a more significant source of illicit firearms than theft, with Victoria Police raising internet facilitated firearm trafficking as an emerging trend. “Adding more layers of red tape to licensed and responsible firearms owners will not get illicit guns off our streets when the problem is at our borders,” Senator McKenzie said. “During this inquiry, no case was made for any increased regulation around gun ownership laws; no evidence was shown to us that banning semi-automatic handguns would reduce the number of illegally held firearms in Australia; and no evidence was found that supported stricter storage requirements having any impact on gun-related violence. Senator McKenzie acknowledged illicit firearms on Australia’s streets was a concern and said that a continued focus on stamping out illegally imported firearms must be a top priority for Government to reduce the level of gun related violence in the community. “However our efforts to get illicit firearms off our streets mustn’t come at the expense of licenced and responsible firearms owners, who provide significant social, economic and environmental benefits to our country,” Senator McKenzie said. “Responsible recreational shooting has produced many Olympic, Commonwealth and World Champions for Australia and hunting is a culturally important activity and legitimate industry that creates jobs and injects billions of dollars into the national economy. 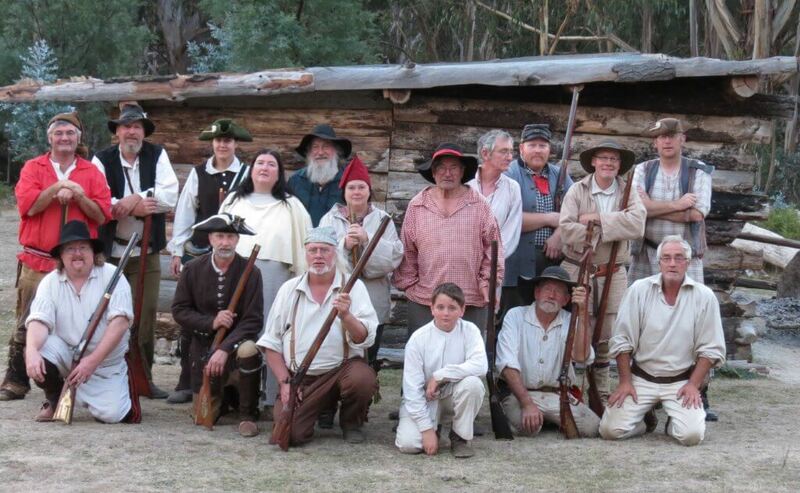 Parliamentary Friends of Shooting event held at Parliament House in Canberra. The Nationals Senator for Victoria Bridget McKenzie launched the Parliamentary Friends of Shooting in March, in an effort to raise awareness about sporting and recreational shooting among parliamentarians. Senator McKenzie said sporting and recreational shooters were often demonised in the mainstream media for participating in a pastime that is not only legal but delivers significant social, economic and environmental benefits to Australia. “Shooting often cops a bad rap in the mainstream media by commentators who are misinformed,” Senator McKenzie said. “Shooting has produced a number of Olympic, Commonwealth and World champions such as Michael Diamond, Laetisha Scanlan and Russell Mark. “The public is happy to support these champions every four years when they are winning gold for Australia but outside of this the sport can be frowned upon – I am committed to changing this. “In my home state of Victoria we know recreation hunting contributes around $440 million per year to the local economy, much of that in regional Victoria. 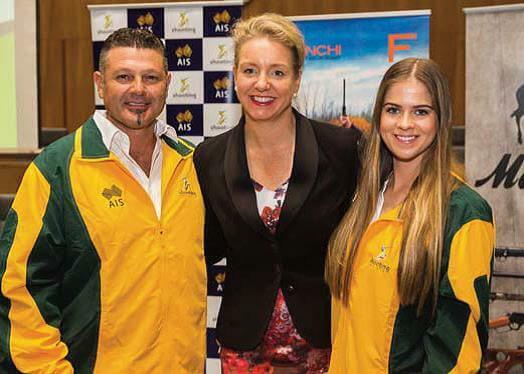 Michael Diamond, Senator Bridget McKenzie and Laetisha Scanlan at the launch of “Parliamentary Friends of Shooting”. Good to see someone on our side, good on you Senator McKenzie for your voice.